Blinkbox by Tesco is offering users the chance to sample 28 Television Pilots. I’ve decided to take those 28 Pilots and give each a watch and then review them right here on my website. First up, ABC’s ill-fated high-concept drama about the crew of the eponymous defunct airline. It’s always strange going into a pilot knowing that the show it was pitching has already made it to air, been weighed & measured – and found wanting. It compels you to begin searching for any potential danger signs. What made this show fail? Was it doomed from the start, buoyed to the schedule on mere optimism? Or did it seal its fate later by squandering its premise on mediocre writing or poor decisions? Sometimes, even with shows which go on to be successful, you can see signs of trouble in the pilot. Fox’s Glee is a smash-hit, one of which I was once a regular viewer owing to its creative premise and talented cast. But now I have disowned the show because of its inept writing, self-importance and wall-banger stupid characters and plot lines. I often said its writers should go back and watch the pilot to remember what show they were supposed to be making. But the truth is, the first signs of trouble were sewn in that pilot. Still, their presence wasn’t the problem. The fact they were allowed to germinate was. Why am I talking about this? Because the Pan Am pilot calls it to mind for me. 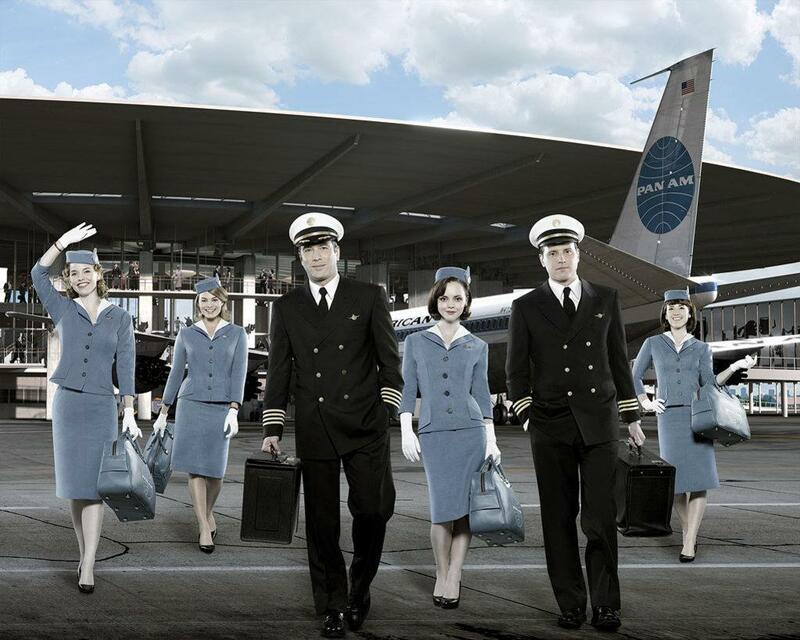 Pan Am has a fantastic premise, and a cast of very talented actors who are a delight to watch. Its pilot makes good use of both that premise and its cast to get you hooked. And yet, as much as I liked the pilot, I think I know why this show failed. The major reason of course is that it was colossally expensive, and the pilot (to its credit) looks exactly as expensive as it was. It is lavishly produced and gorgeous to look at with elaborate sets and costumes, plus a distinctly high quality filmic appearance. But expensive shows can make it if they find a large enough audience of valuable viewers. So why didn’t Pan Am manage that? After all, the premise is appealing, the cast are great, the production values are sky high (pun very much unintended, but kept out of begrudging amusement)…What Is the problem? Of course, I can’t know for sure without seeing the other thirteen episodes, but I think I have some ideas. You see, for all the love and attention the show seems to have lined up for its premise…It also decides to hedge its bets. You came here to see a show about the crew of an airplane in the golden age of passenger flight? TWIST! Here’s an international espionage plot! Yeah. That sort of came out of left field, didn’t it? It’s not really clear what amount of the show will be taken up by the CIA-MI6 covert operations subplot, but it’s hard to imagine wasting as much screen time on it in the pilot (and linking it to several characters) if it’s not going to be a major recurring storyline. This is the kind of storyline showrunners attach to shows with high-concept premises, apparently to give them depth and broader appeal. It’s also the kind of storyline which annoys the people who showed up for the premise. Many a SportsNight fan wished to be rid of the interminable Casey/Dana romance subplot so we could instead focus on the crew making the Sports show. I’d be amazed if there was a single Glee fan who wasn’t contemplating throwing the TV out the window every second the “fake pregnancy” storyline was taking up screen time. 24 had so many around the middle of its original run it’d be impossible to list them all. These are plot tumours. They don’t naturally live in the shows they’re part of, and really only serve to distract. Sure, we get it, Pan Am flew during the Cold War. But if we wanted to see a James Bond film, there’s plenty of them to choose from. The introduction to the subplot is especially lazy, with a cartoonish “Russian Spy” whose actions are far too suspicious to be believed. I won’t spoil the resolution, but you probably already guessed the gist of it. I know I did the moment he appeared. That speaks to the greater problem. It’d maybe be possible to put up with the Cold War Plot Tumour if it seemed like it was going to have something interesting and unique to say. On the basis of the Pilot, I would doubt that it does. Fortunately, the rest of the episode’s plots are exactly what you’re looking for. Christina Ricci does a marvellous turn as an irreverent purser, breezing around cockily and in so doing introducing us to some of the zanier aspects of being a Pan-Am-Stewardess. Oh, and get used to “Pan-Am-Stewardess”, because every character who gets a chance to say that phrase in full, does so. The pilot really plays up the whimsy and wonder of the titular airline – even going so far as to treat the take-off of the plane as some kind of bold adventure. Admittedly, it is the particular plane’s maiden flight, but – the way the flight crew is acting – you’d think their destination was Mars, not London. Unsurprisingly, the most compelling scenes are those in the air and in the airport. And when the concept is able to shine through the distractions, the pilot is very watchable indeed.